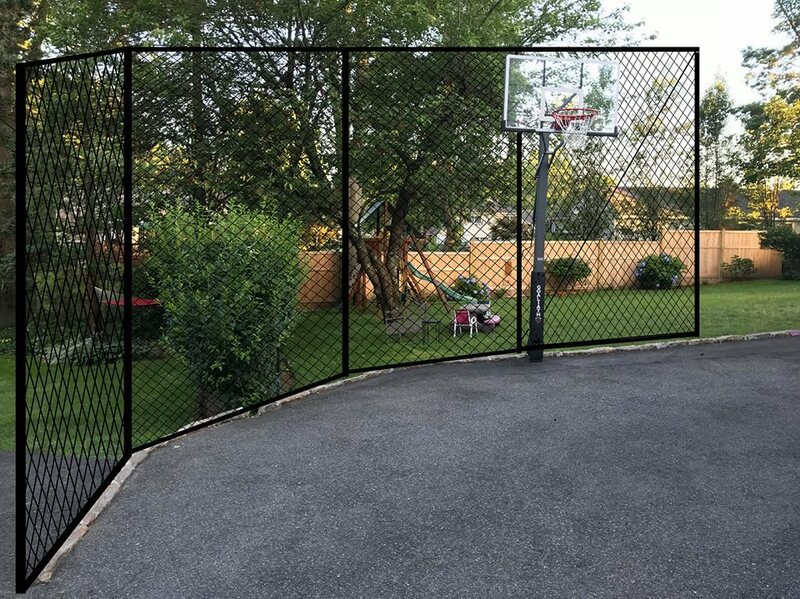 Along with being a CERTIFIED SERVICE CENTER for Razor, Power Wheels, Peg-Perego, Kid Trax, Radioflyer, and Dynacraft, (and also for some quads, ATV's, Go-Karts, etc...) we will now also build your vehicles for you! 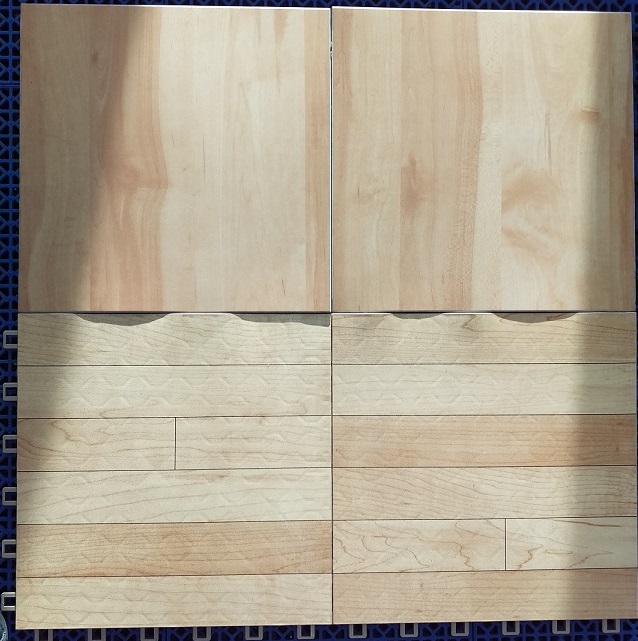 Eliminite the hassle of having to go through the shipment process, and the worry of damages done in the packing/shipping process! 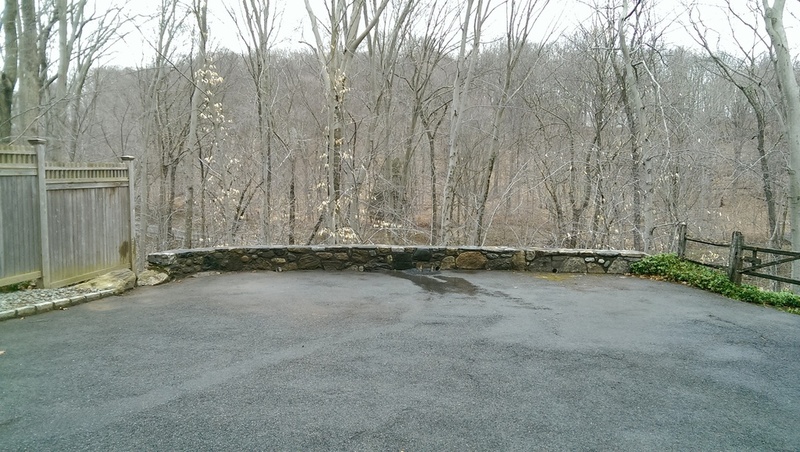 Have them shipped straight to our store and our service guys will be happy to take care of getting your vehicle ready for riding ASAP!! 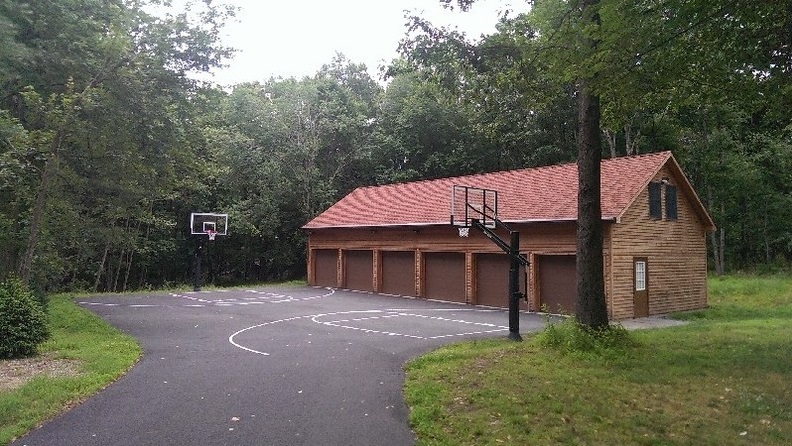 Your vehicles will be PROFESSIONALLY INSPECTED BEFORE SIGNING FOR THEM AND ALSO BEFORE ASSEMBLY! 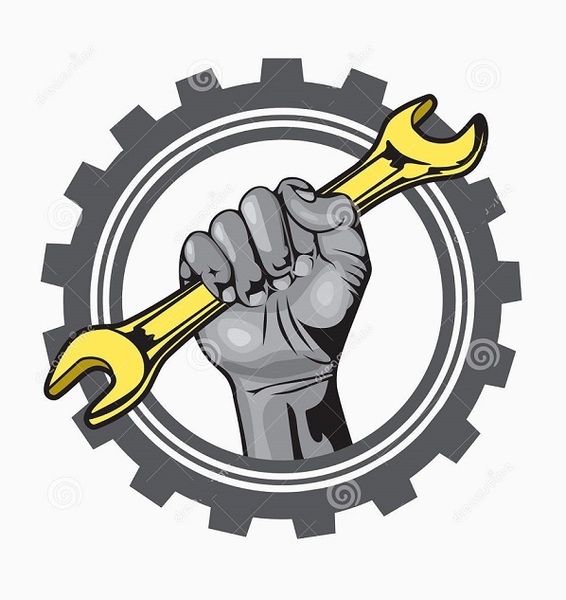 Your vehicle WILL ALSO HAVE A FULL SAFETY CHECK PERFORMED BEFORE BEING RELEASED FROM OUR SERVICE GARAGE!! 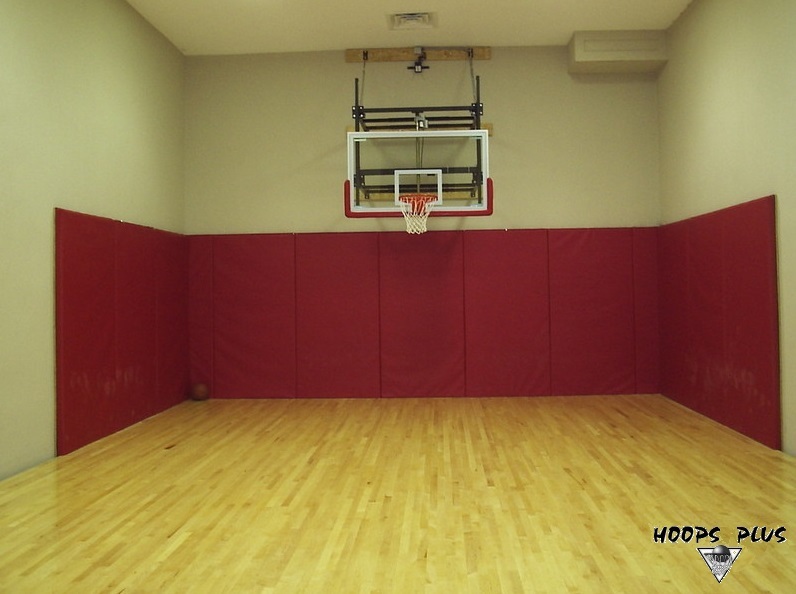 We will also be happy to help with ANY assembly/installation needs you may have- from previously purchased basketball systems (portables/wall and roof mounts included), to game tables and trampolines that need a little "fixing-up" or putting together- our service men at Hoops Plus will help make sure your assembly/installation and service needs are taken care of! 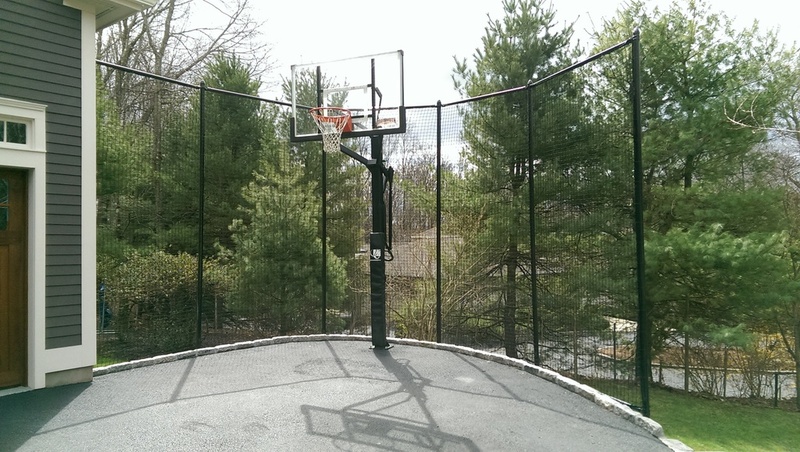 Hoops Plus Delivery and Assembly Service has been in business for 30+ years, with the MOST EXTENSIVE KNOWLEDGE of the business within the Tri-County Area! 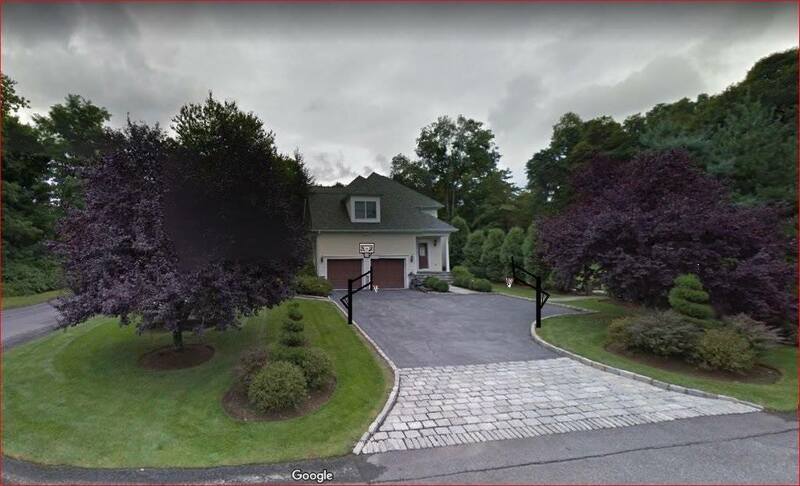 (Westchester, Putnam and Lower CT!) 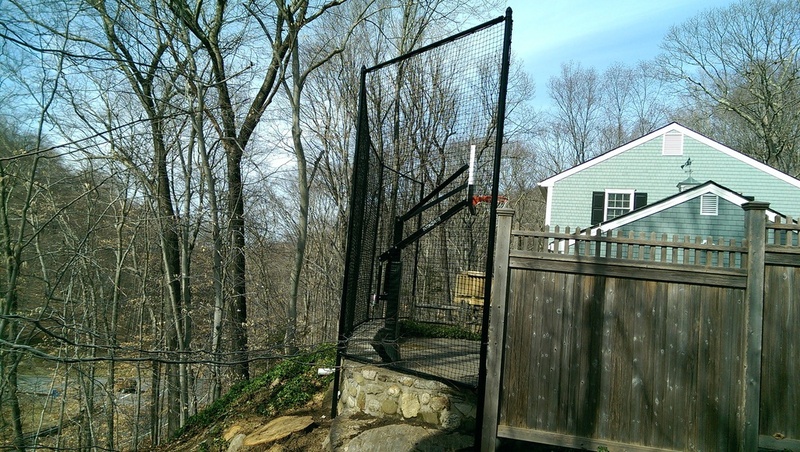 Our service men have a wide variety of expertise and we here at Hoops Plus are CONFIDENT that NO MATTER THE ASSEMBLY/DISASSEMBLY /OR INSTALLATION NEEDED- OUR MEN ARE THE RIGHT MEN FOR THE JOB! 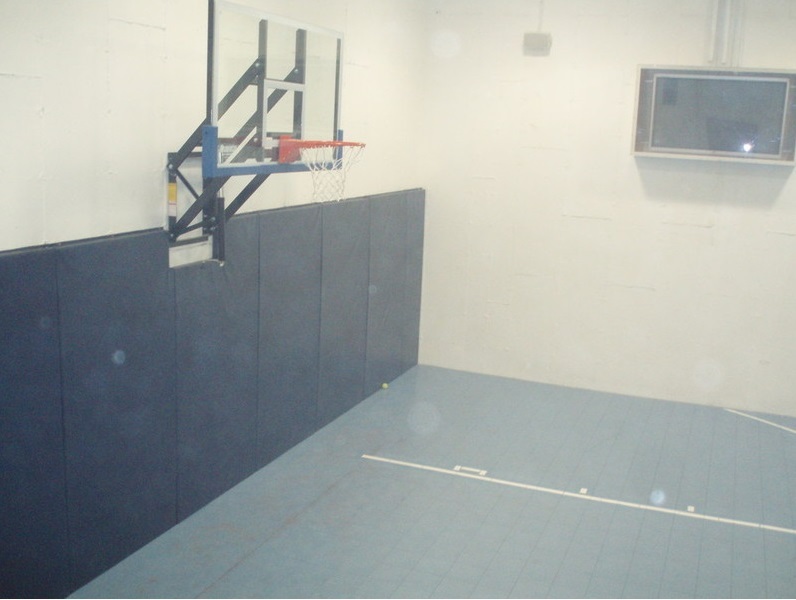 For any further information or general inquiries, please feel free to call us directly and we will be happy to discuss your needs!! 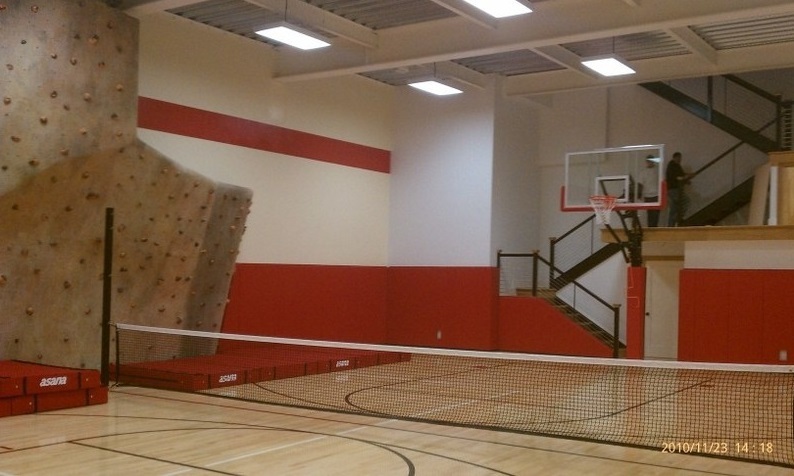 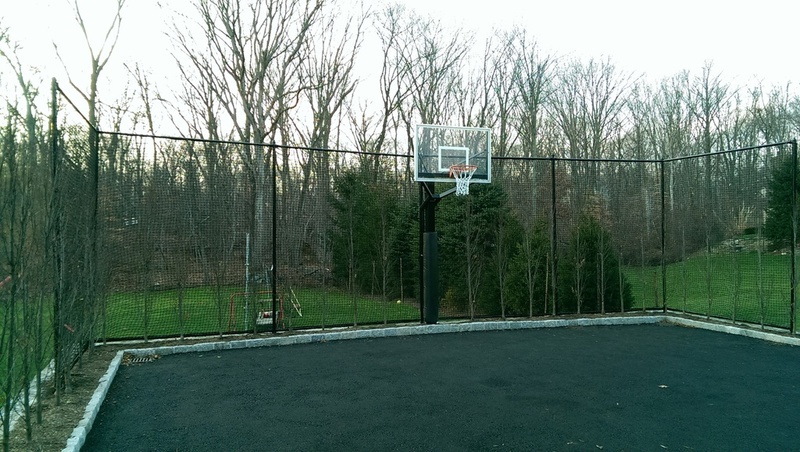 We create entire multi-purpose game courts consisting of premium basketball systems, nightime lighting, adjustable net systems, tetherball, sports flooring, batting cages, etc. 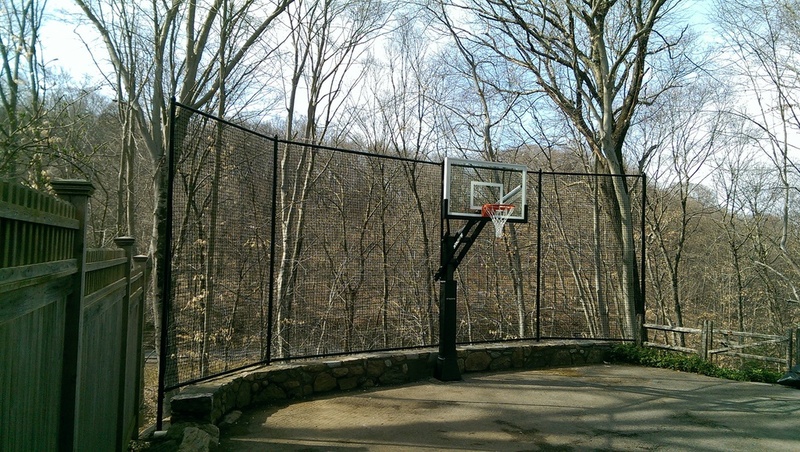 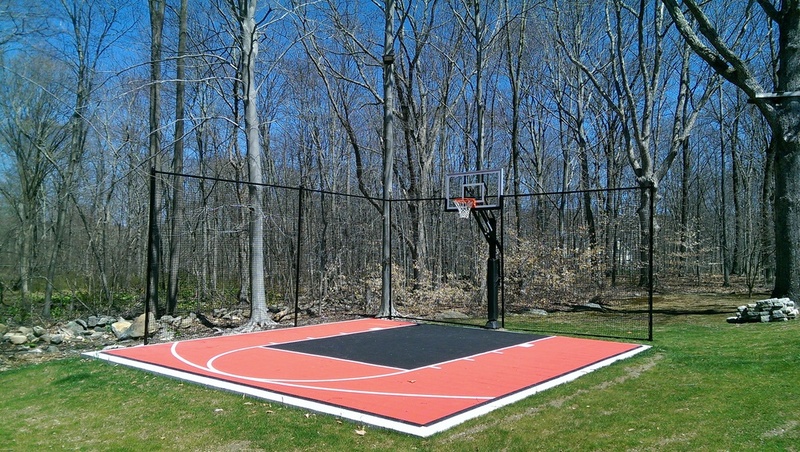 Our basketball and recreational products are high-end and top quality. 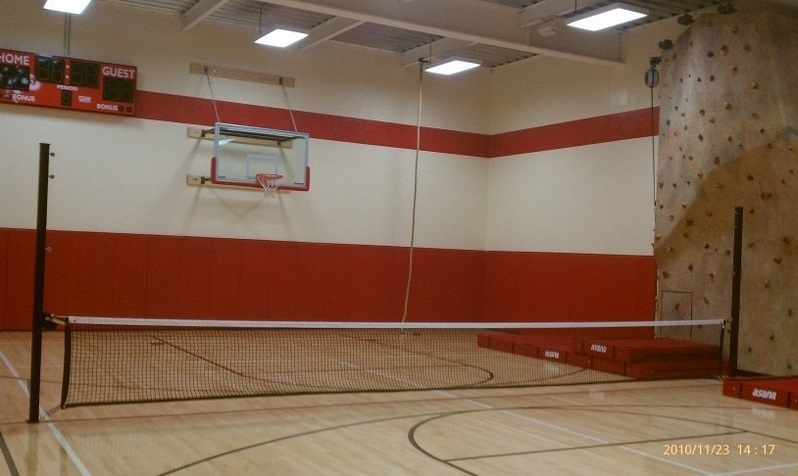 In addition to wall mounts, portables, and freestanding units, we also handle custom installations. 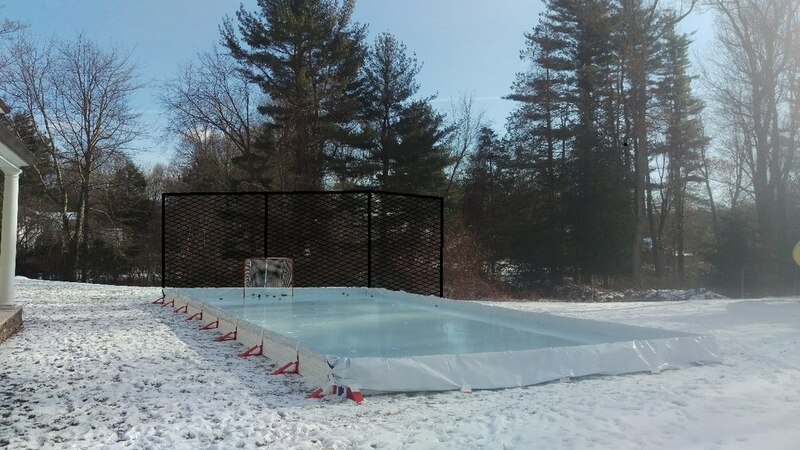 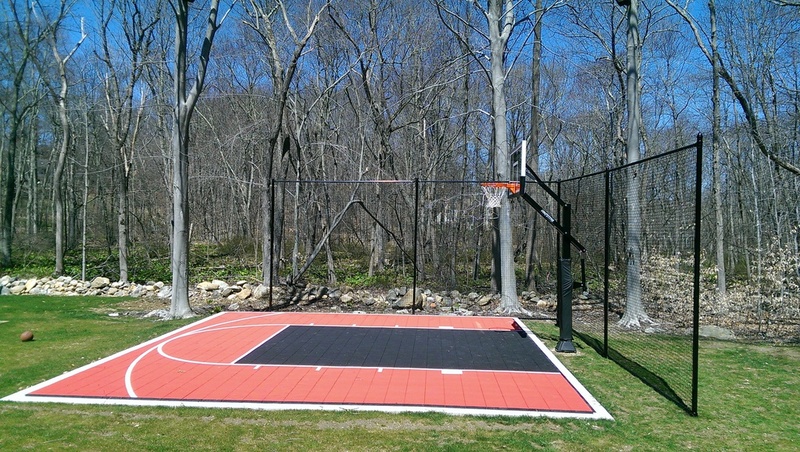 Call Hoops Plus if you are interested in net containment systems, court stenciling, hoop lighting, outdoor game tables, poolside products, etc. 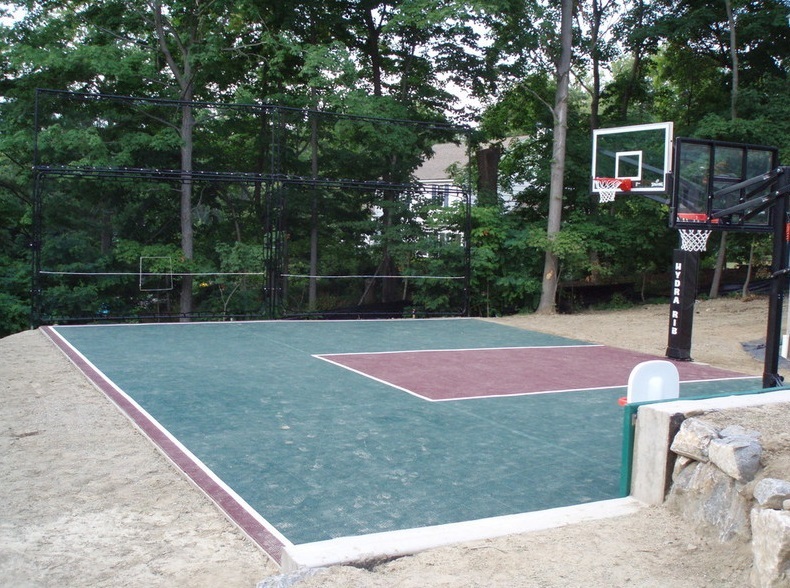 Convert that unused playground area since your kids have outgrown it in a full performing basketball court! 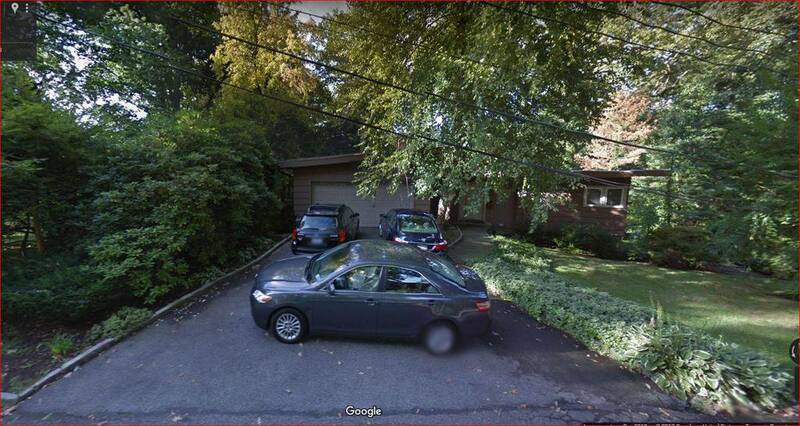 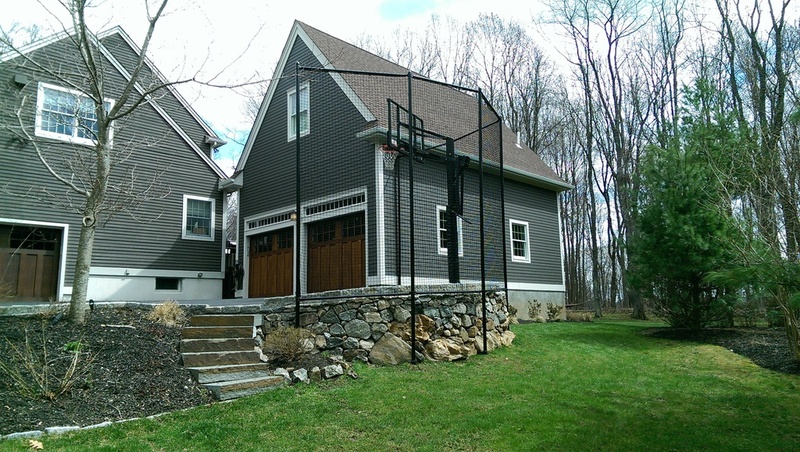 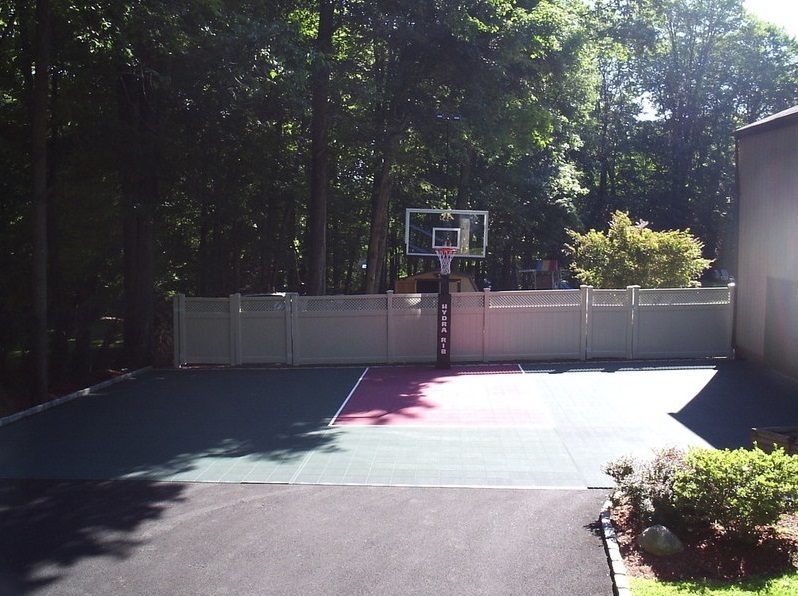 We can utilize your existing outer perimeter (I.E. 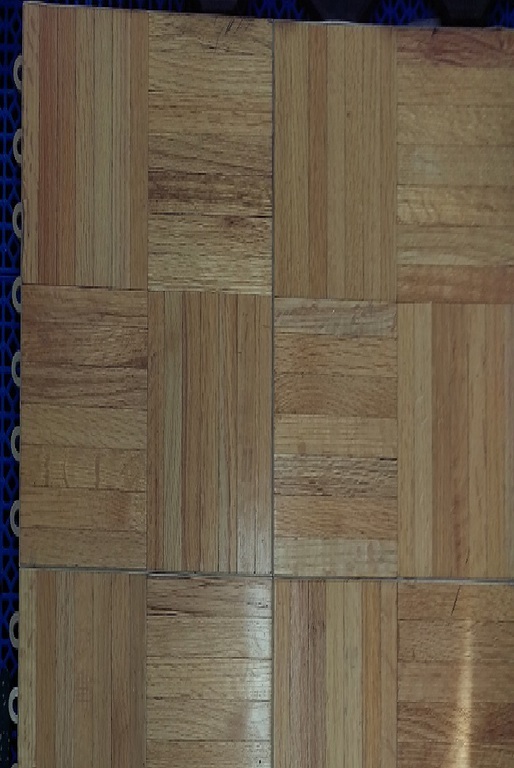 landscape ties, or Belgian block), and work within the same boarder. 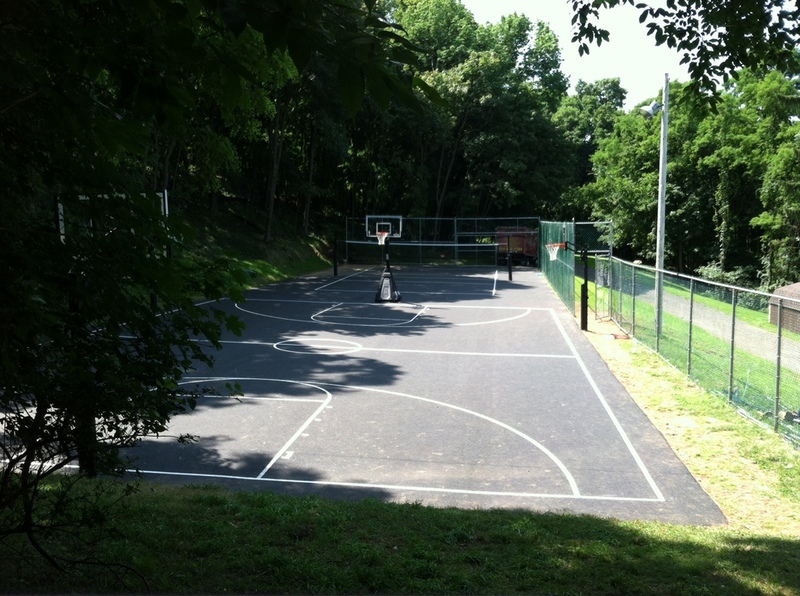 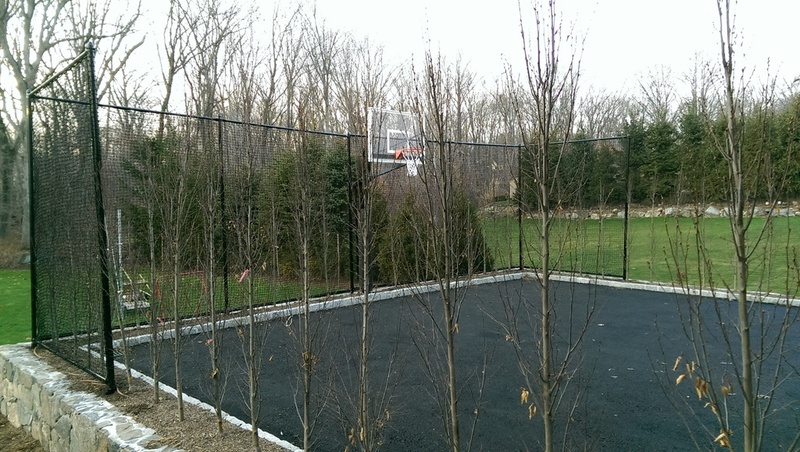 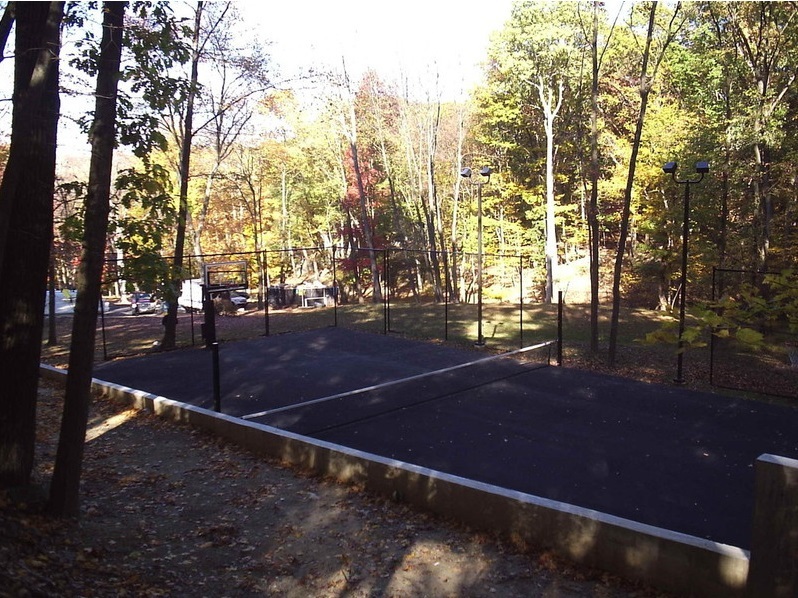 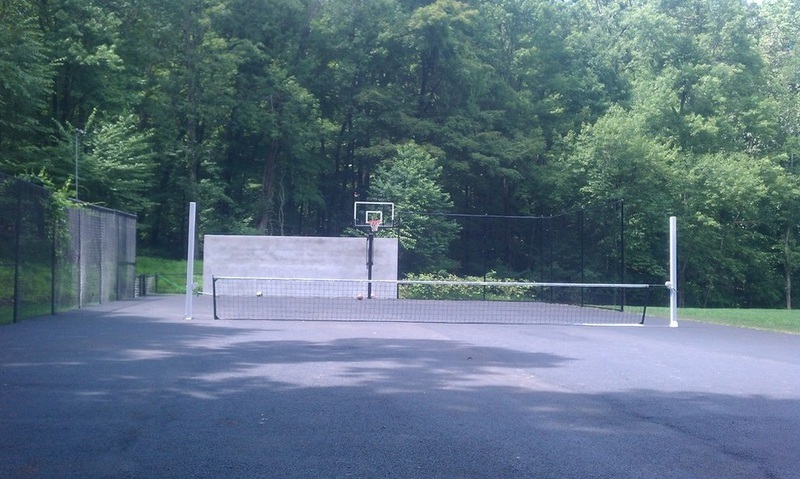 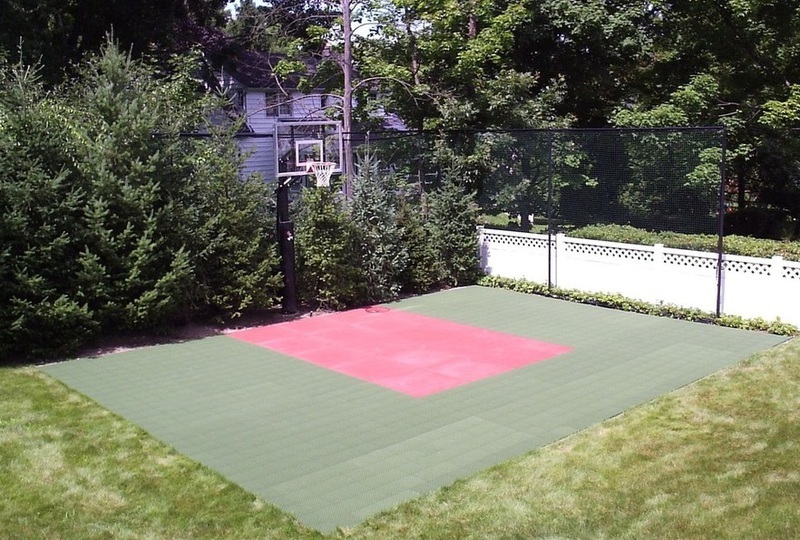 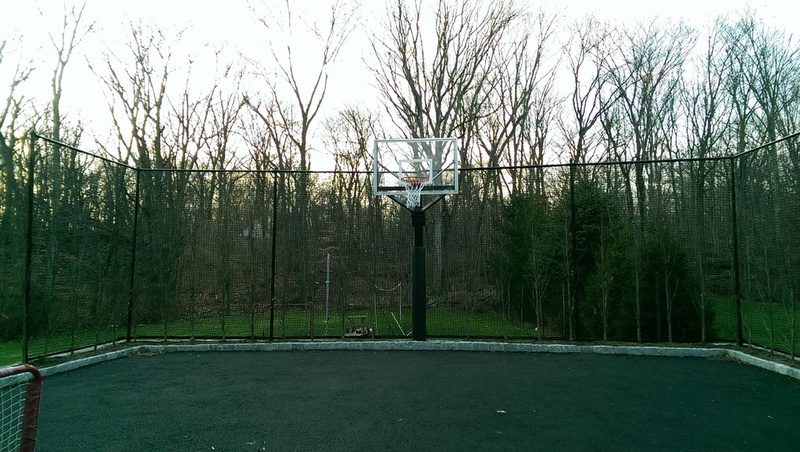 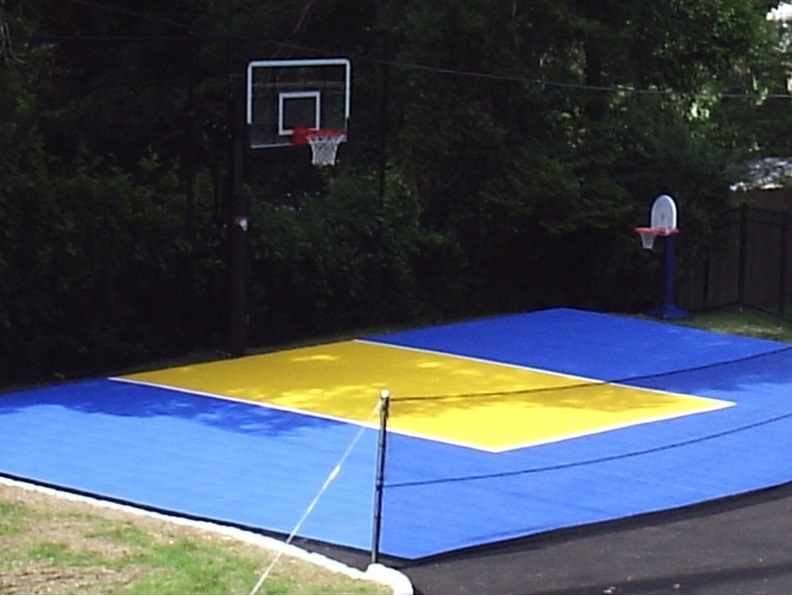 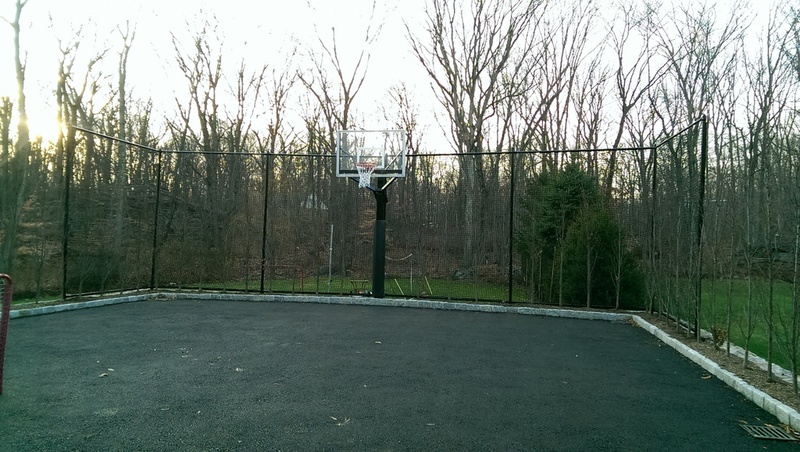 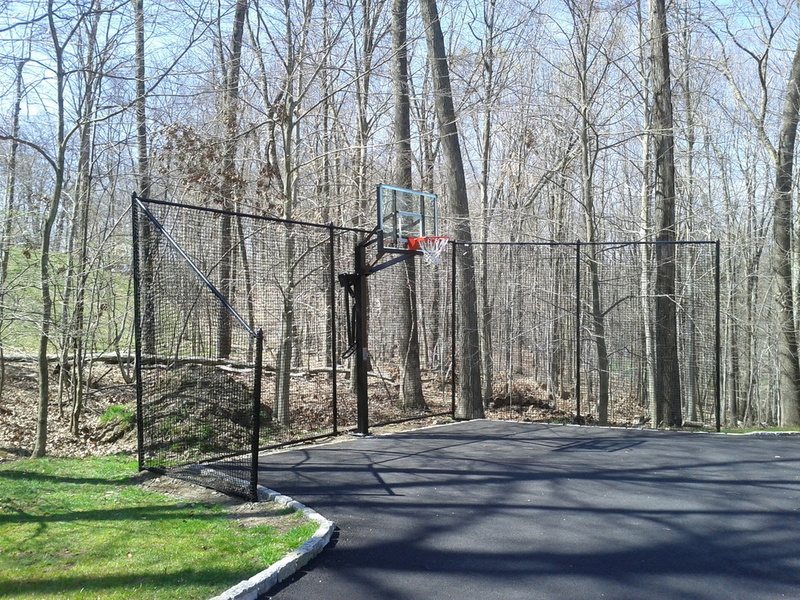 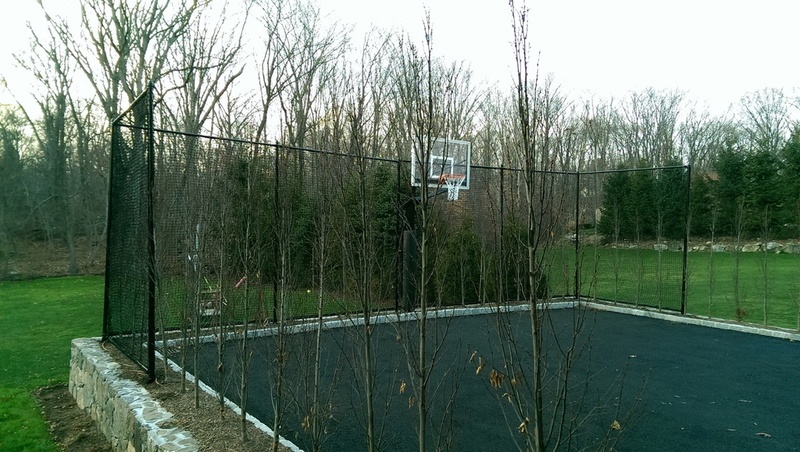 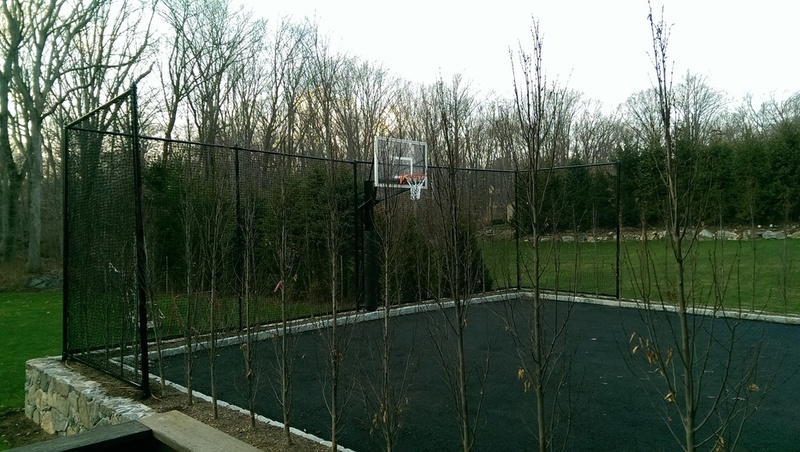 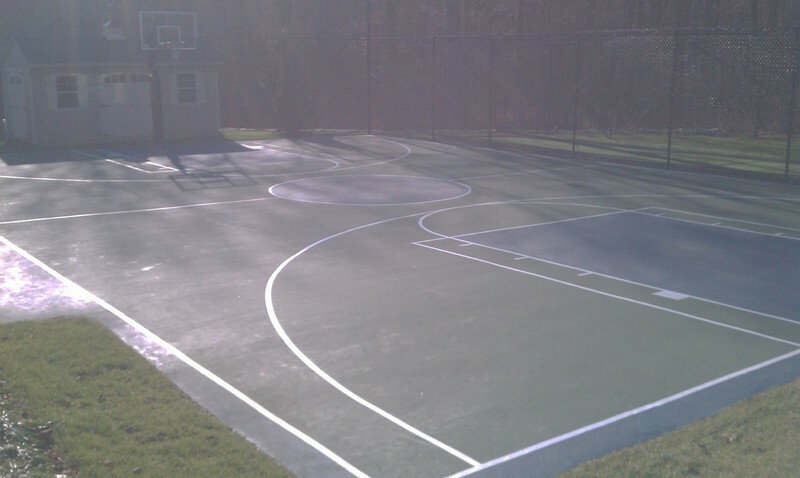 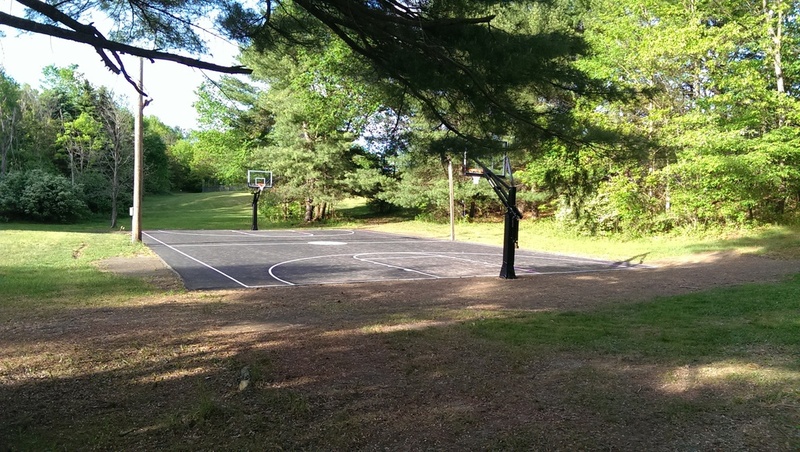 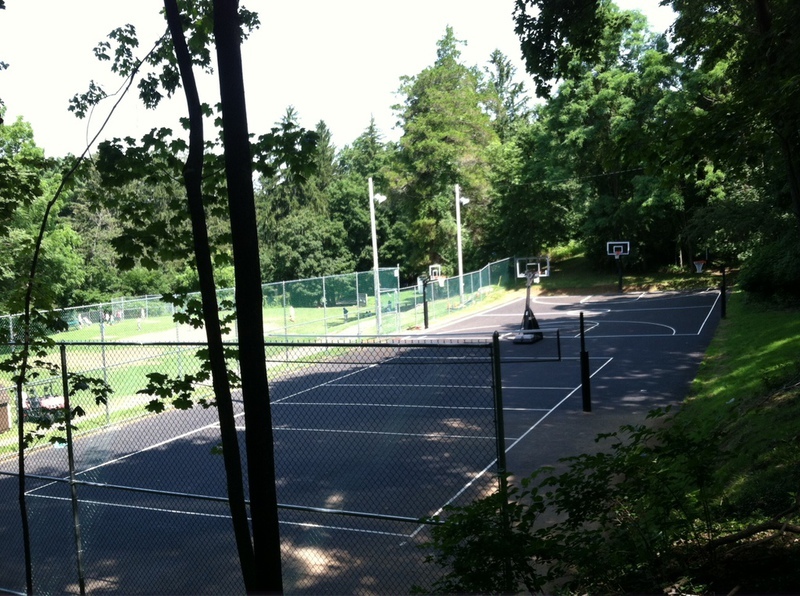 Unique patented court panels allow us to create a solid, even play surface without the need for common expensive blacktop or concrete. 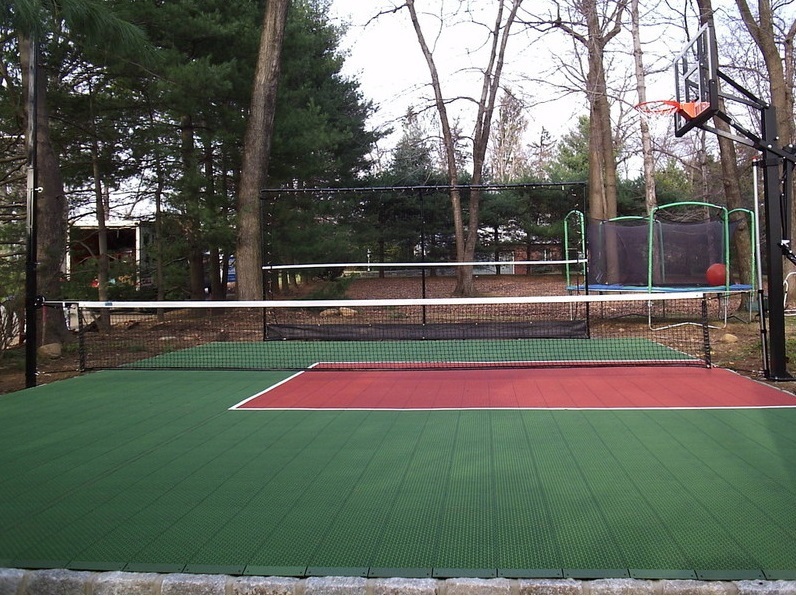 Multicolored court tiles can then be added to provide necessary movement and absorbency to relieve players of trauma associated with unforgiving surfaces, such as blacktop or concrete. 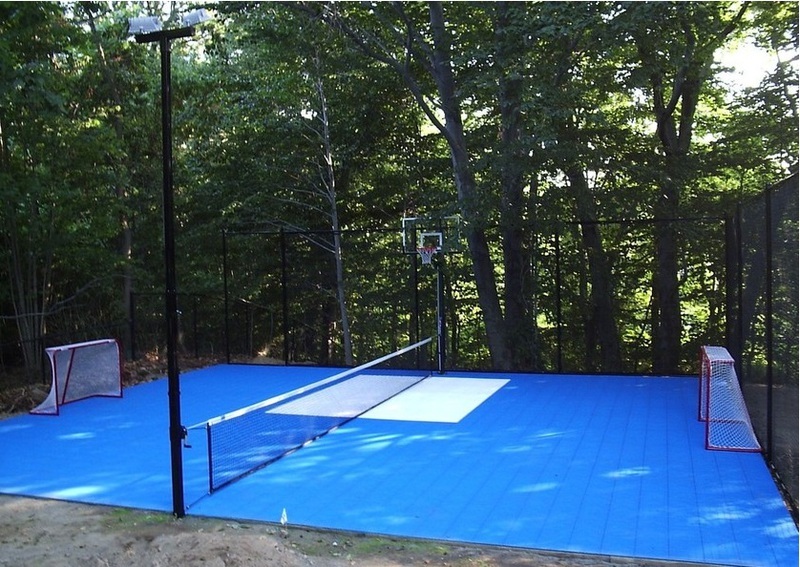 Colored sport tiles also offer elimination of puddling up to ¾” high, and will keep your court 50% cooler, and probably most importantly, will help beautify your new court. 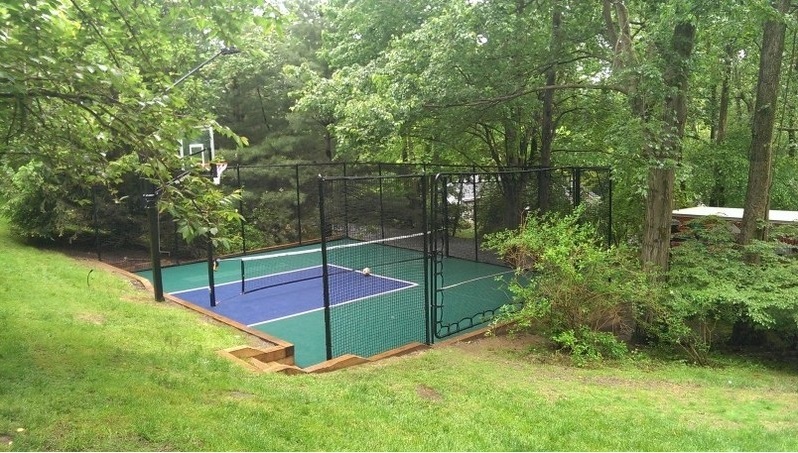 Our unique layout and design also enable your yard to stay in pristine condition as there is no need for heavy machinery/trucks (I.E hauling concrete or blacktop) on your property. 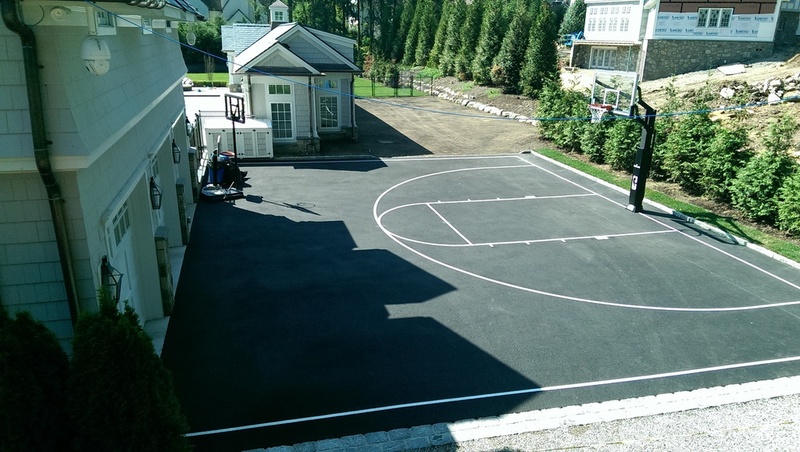 Please call us at your earliest convenience if you’re looking to create your own court, as this new service is exclusive to us!! 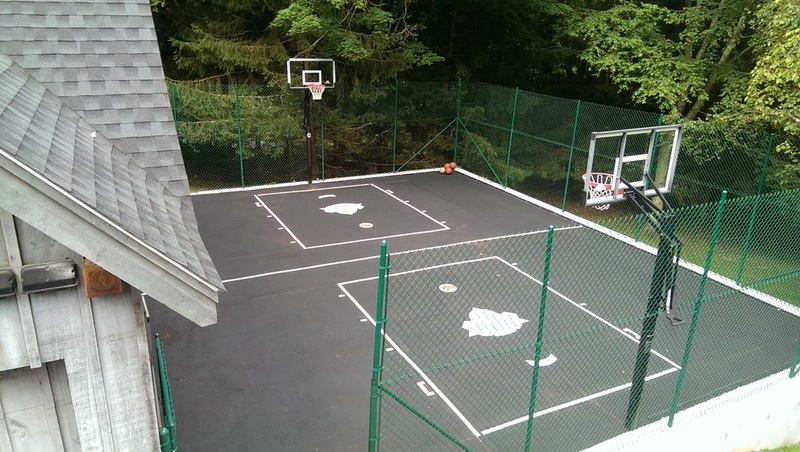 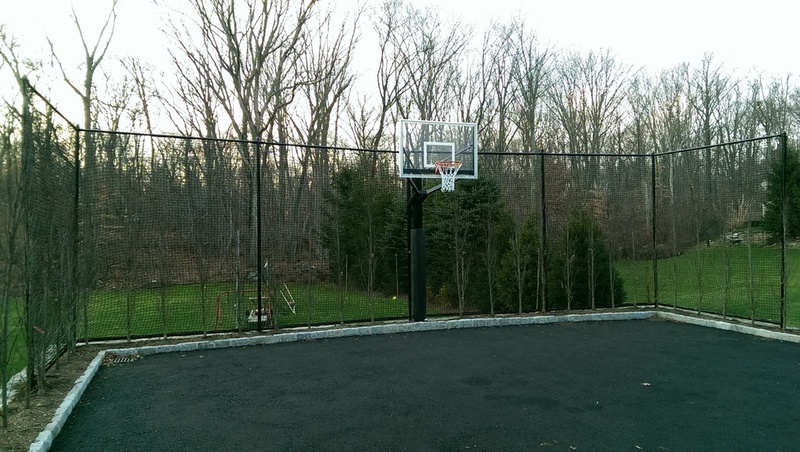 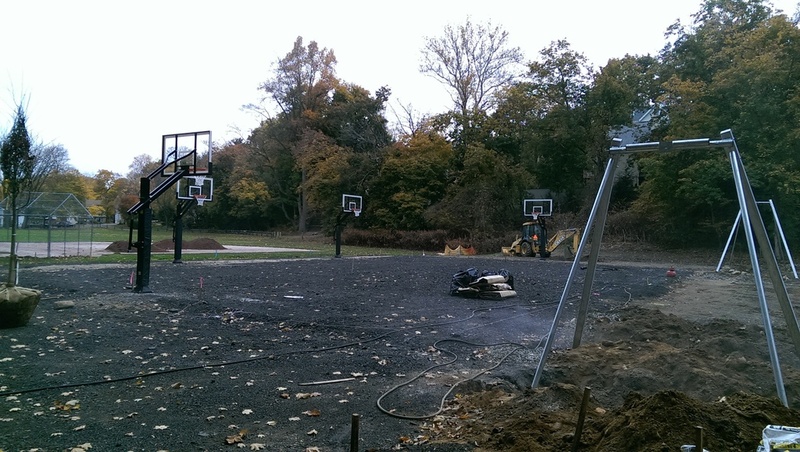 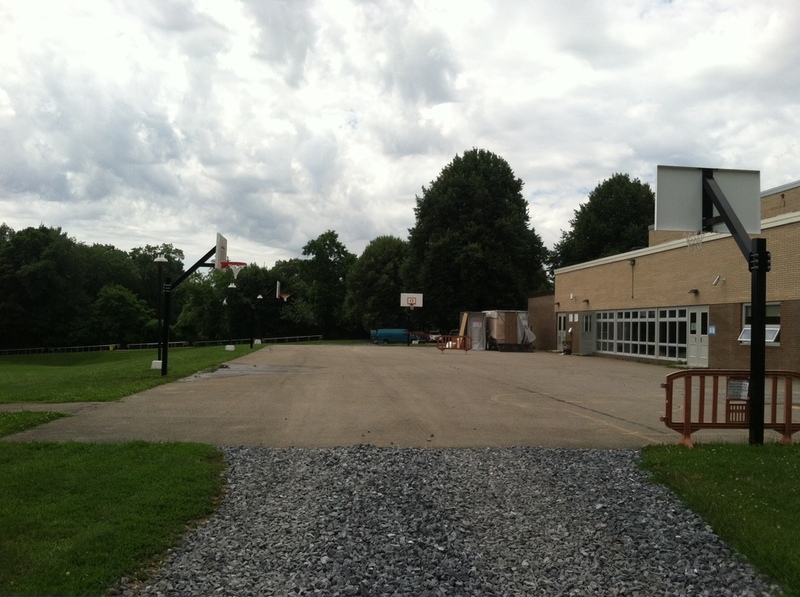 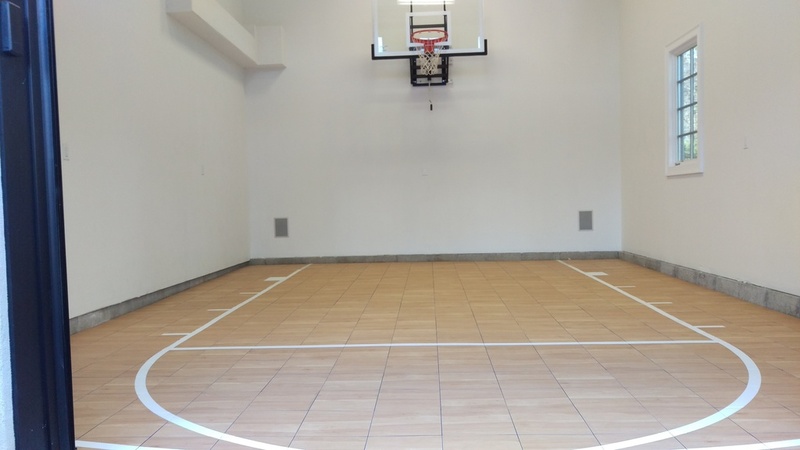 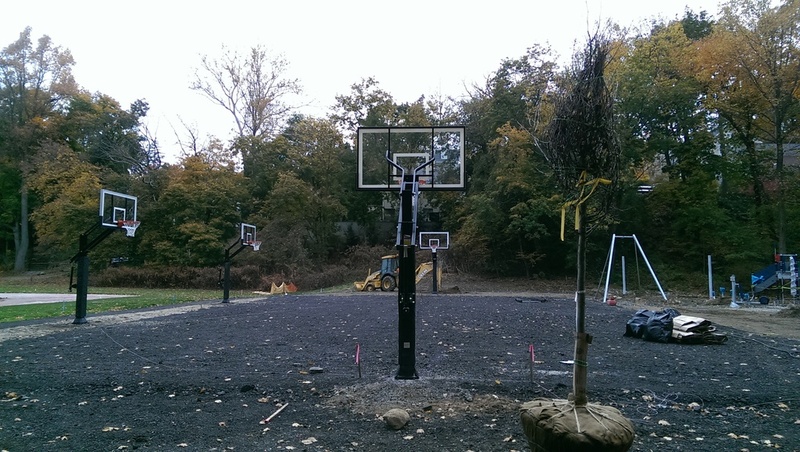 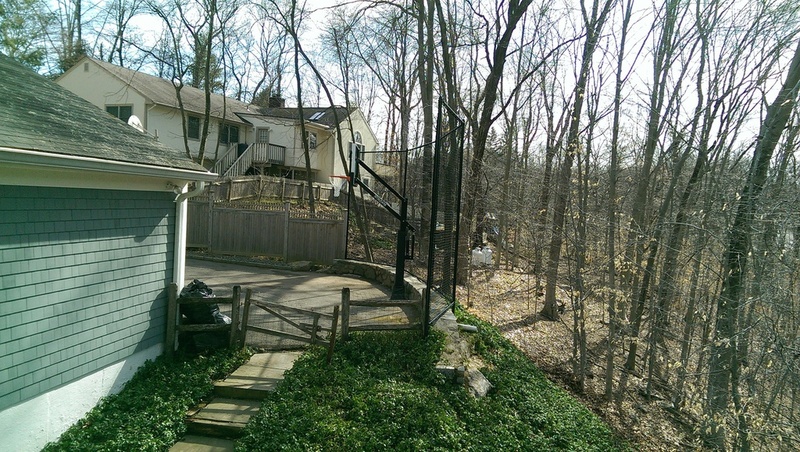 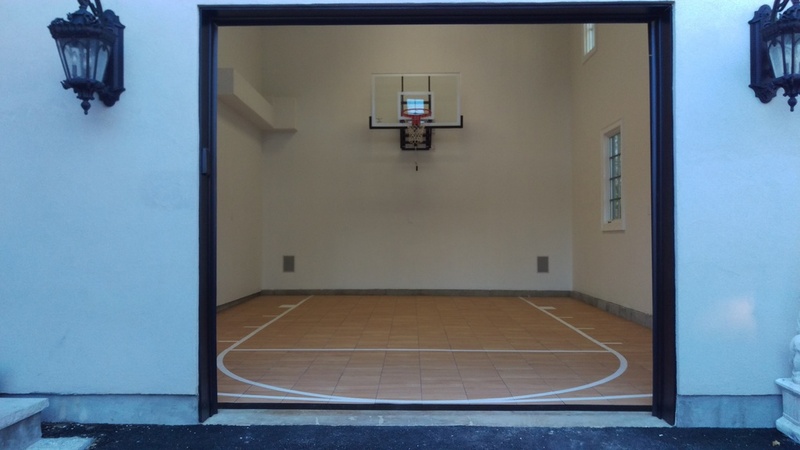 Convert that unused garage or courtyard area into a full performing basketball court! 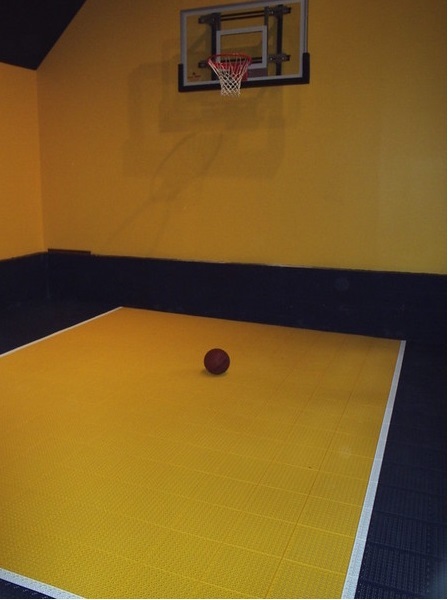 Whatever the size, however big or small the space, our guys can help you with all your sport flooring needs! 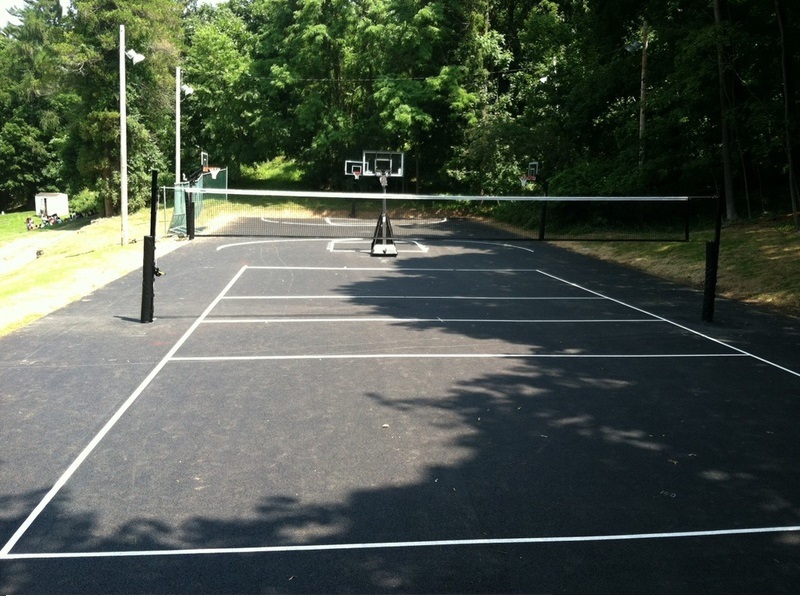 Stock size 24' W x 12' H but CAN ACCOMODATE CUSTOM SIZES/ORDERS!! 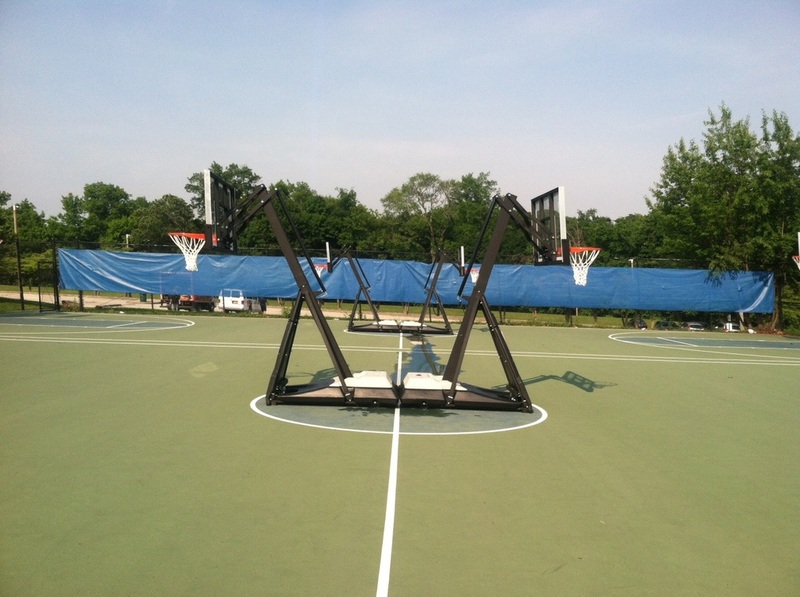 In certain scenarios we are able to rectify basketball systems that have been damaged due to an impact from a car, truck, etc. 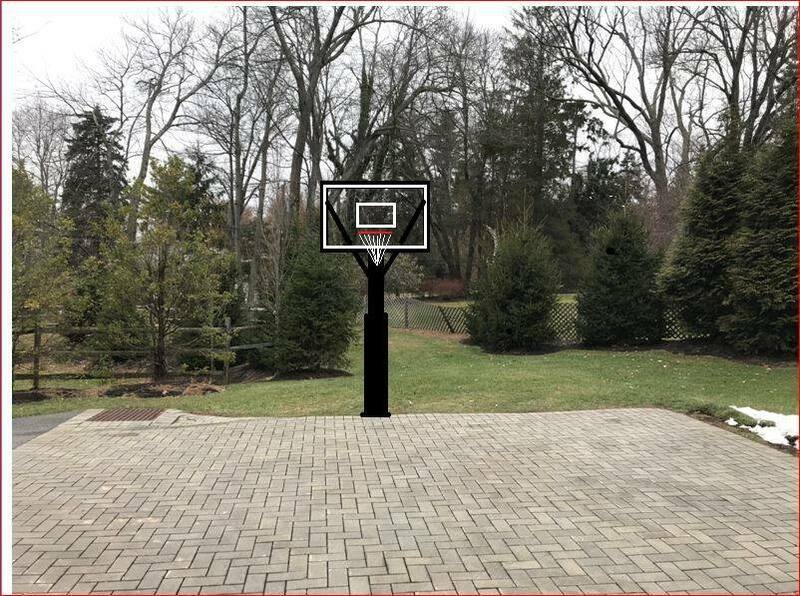 Depending on the extent of damage, we can try to salvage the existing system either by replacing damaged parts and/or resetting the base in the ground. 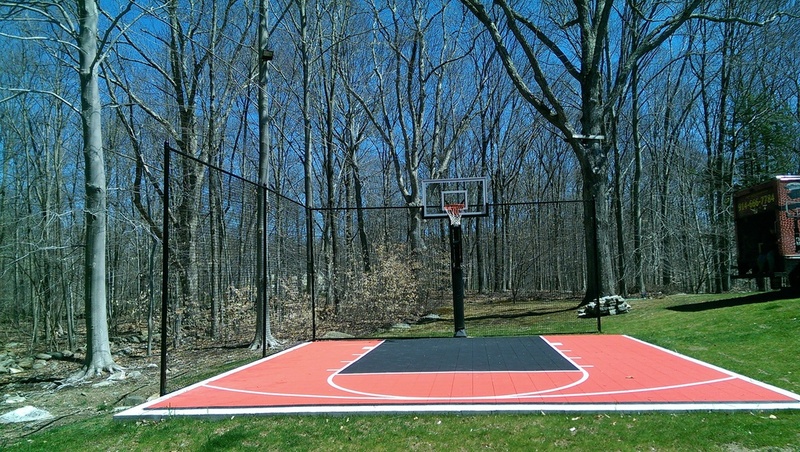 A Unique process only offered by Hoops Plus to recreate the original screen painted lines that have worn away over time. 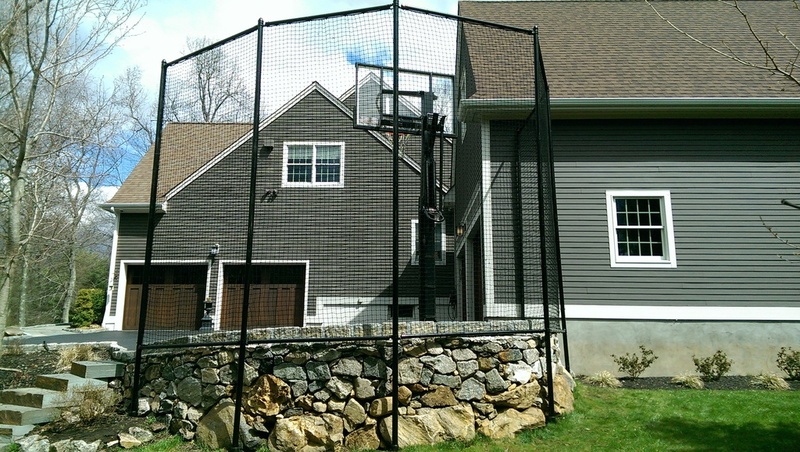 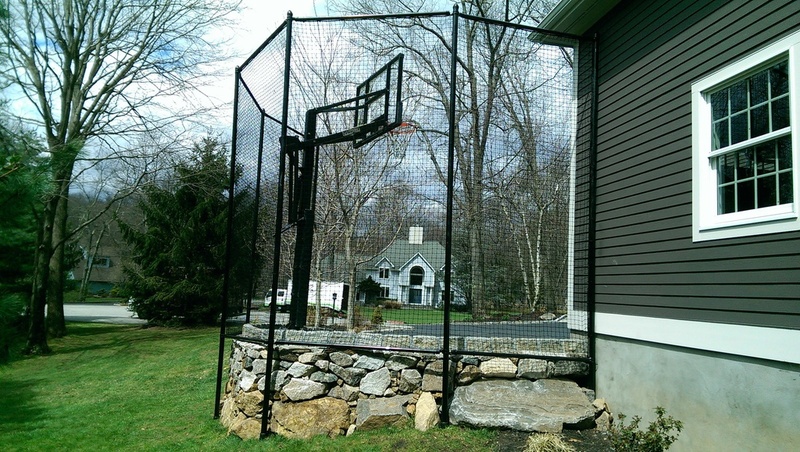 This service includes a reestablished outer perimeter backboard line, shooters square, and a new white heavy-duty net for your rim. 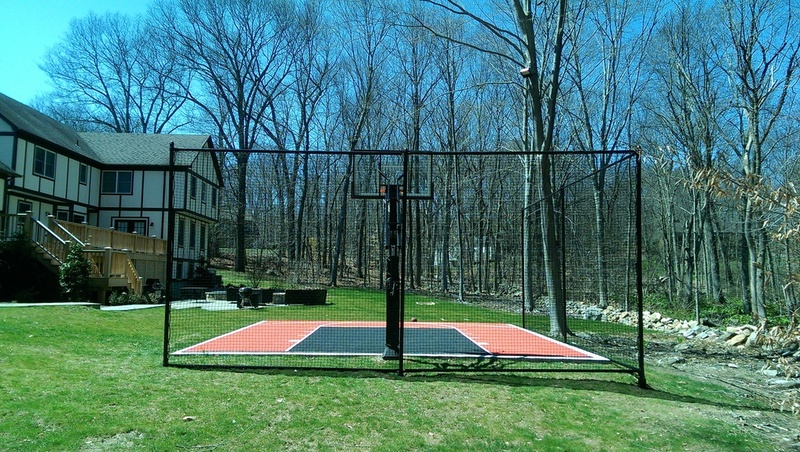 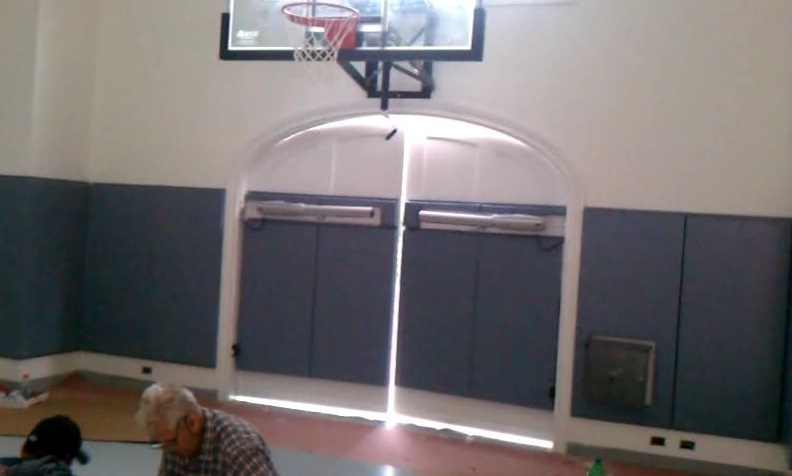 A Unique process only offered by Hoops Plus to remove your broken/damagaed backboard and replace it with either a brand new backboard, or a certified refurbished backboard! 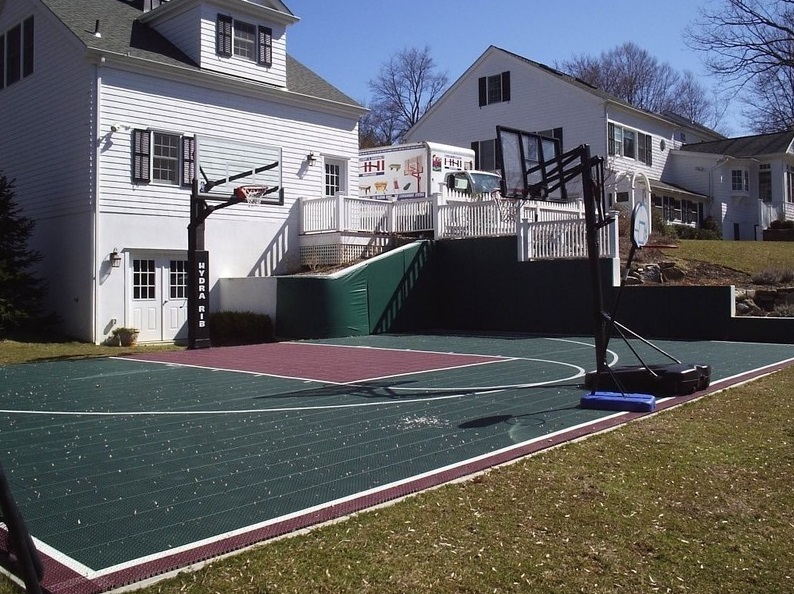 Our professional service guys will clean up all broken glass, leaving your play area safe and ready for play! 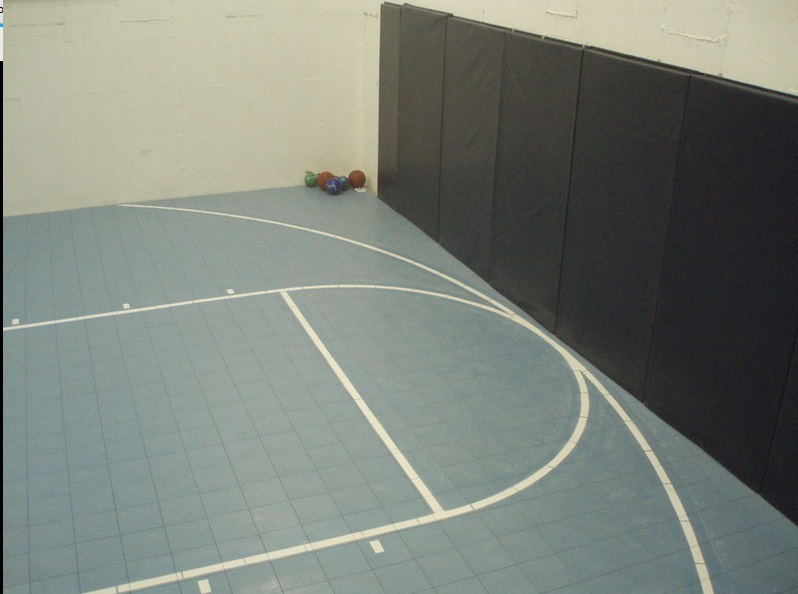 Stop by our store or call today to talk about what options you may have! 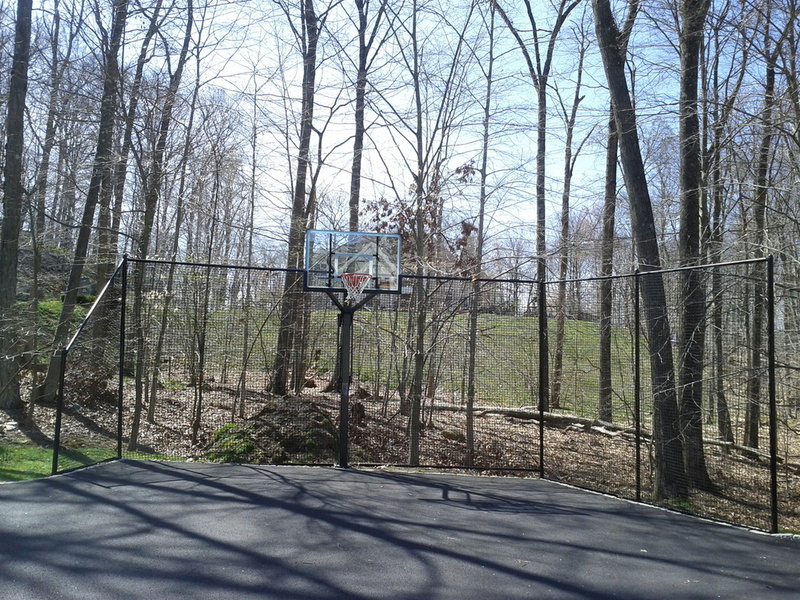 Hoops Plus repairs and refinishes the most trampolines in the Westchester & Fairfield Counties! 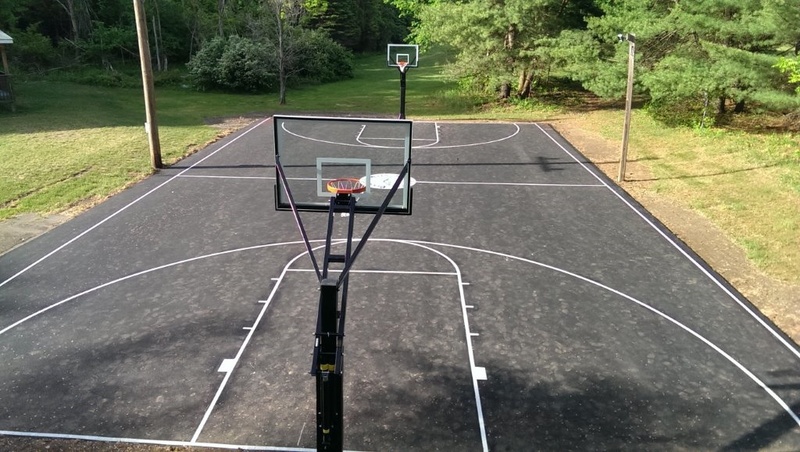 Hoops Plus will fix it all. 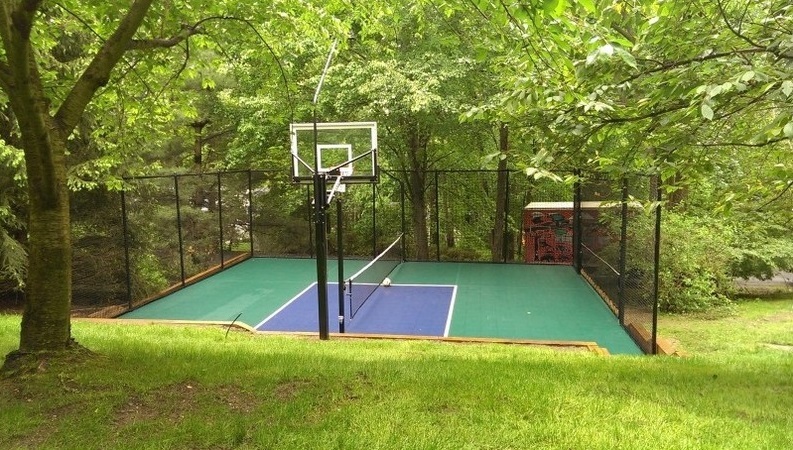 Protects children from possibly injury while playing!